In April and May 2012, SSPLS was contracted by Daniel O’Connel’s Sons to perform the first two phases of a five phase project on the MDC-Hartford WWTP. The first work item was a 30″ wet tap on a 104″ R.C.P. (Reinforced Concrete Pipe) treated wastewater effluent line. This work proved to be more challenging than was originally anticipated. Upon excavation of the pipe, it turned out to be so badly deteriorated that even with our JCM double gasketed sleeve, we could not get a seal. We performed a repair on the pipeline surface utilizing a two part repair system as manufactured by SIKA. Once the repair was cured, we re-installed the JCM tapping sleeve and AFC tapping valve and got a successful hydrostatic annular seal test. Prior to tapping, and to give extra insurance, we had the Furmanite joint sealing division install a joint seal within the annular space of the sleeve and then proceeded with the tap. The tap took 9 hours to complete, but in the end, the entire coupon was retrieved and the repair held up 100%. The second phase involved providing a means to stop the flow in a 36″ R.A.S. (Return Activated Sludge) line in the lower level of the WWTP. The line was about 15′ off the floor and due to space constraints, the work had to be performed on the dead bottom of the pipe. 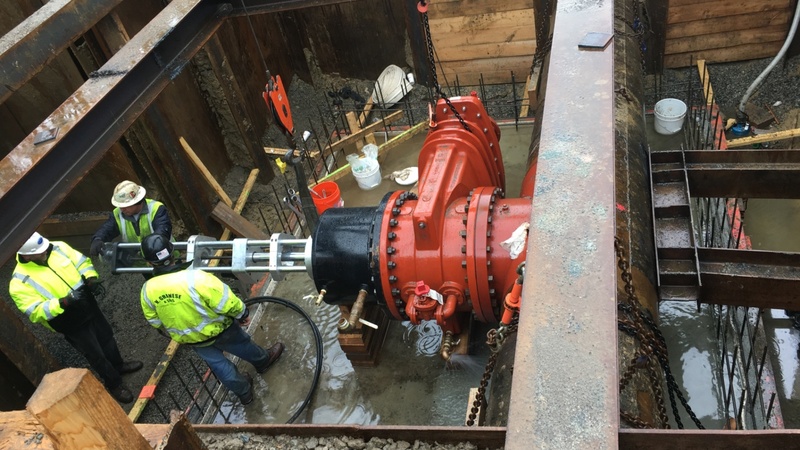 Since a conventional linestop would not have worked due to the lack of space, SSPLS furnished and installed a 36″ x 16″ Save-A-Valve fitting with a completion plug and utilized a Peterson High Pressure bag to stop the flow. As with most of our clients when the decision is made to use a Peterson bag, we furnish and install the tapping fitting, make the tap and in the end install the completion plug. We spec out what our clients need to purchase from Peterson and then assist them with the bag work. With respect to this project, since there are three more of these to do on this project, this saved not only our Client but also MDC-Hartford money. Even though we are not completed with the entire project, we do wish to thank DOC for allowing us to work on this project with them, the crews from MDC-Hartford as well as the union laborers, operators and carpenters on this project from Locals 230, 478 and 43 who were just awesome to work with!